Whew, it's done. Since there's so much going on in there, and I don't have a wide angle lens, I'm going to individually feature several views of the room. This wall is to your right as you enter from the sidewalk through the screened door. It's the wall where the sofa finally stayed. In a previous post, here, you saw the sofa and mirror. I was indecisive about the columns. I decided to keep them in the mix and used a dry brush technique to get them to be the same color as the mirror. I'll do a tutorial on this in another post. I decided not to use the chartreuse accents I was considering in the previous post. 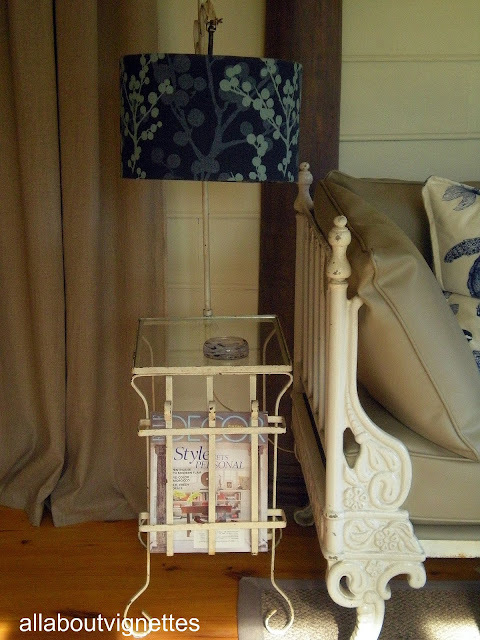 On one side of the sofa I used a painted garden table with an attached lamp and a magazine rack. And on the other side a vintage medical cabinet with its original chippy swirly paint design. 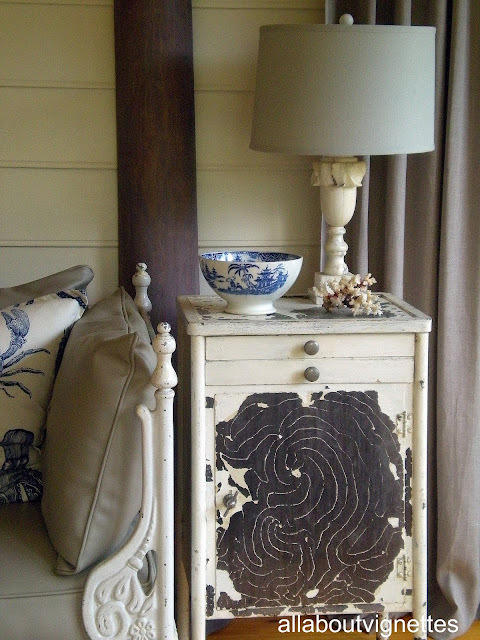 I added an alabaster lamp, blue transfer ware bowl, and a piece of coral. This is another angle of the same view. In the foreground you can see my factory cart. It was painted red, green, and yellow. I'll do a separate post to tell you how I achieved the Belgian look. Below is a top view of the factory cart. On top of the cart I placed weathered medical books, bound with twine and topped with a starfish. 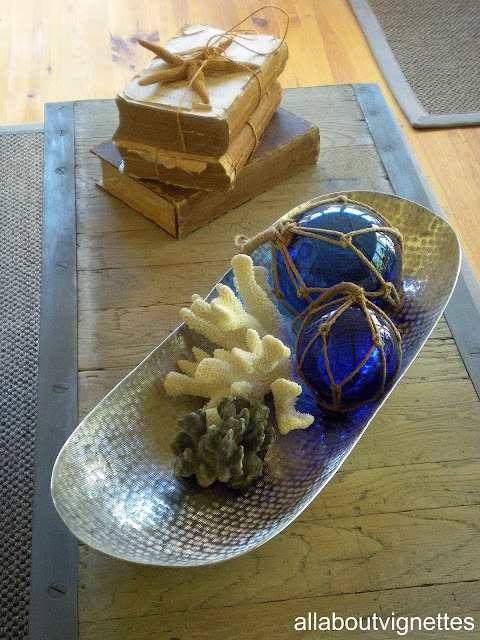 In the large hammered metal bowl are some floats and shells. Next post will feature another view of the room. Three views in all. If you missed the original post, go here. To see view two go here and for view three here. are you coming to lucketts this weekend? just curious! if you do come say hi!!! Kathy this room looks great. I love the sofa and the coffee table looks great. The blue floats are awesome. So incredibly gorgeous Kathy, like something out of House Beautiful magazine, swoon girl! THanks for linking up to the party this week! This is so beautiful. I don't want to leave this space...I just want to sit and relax. Thanks for sharing. what a great space i am sure you will spend a lot of time here now it looks so nice! Your porch looks amazing!! I love the beautiful day couch. This porch is dreamy. I love the columns and the cart table. It's all so nice. Beautiful porch !! Love the table and the coastal touches, too !! Would love to "sit a spell" out here. Gorgoeus porch! Love the table and the whole thing is nautical and relaxing...nice to sit in it and pretend you're listening to the sea waves! the room is spectacular! 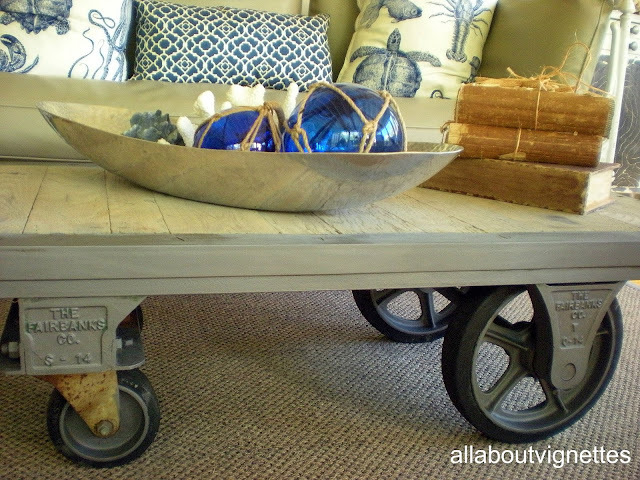 The cart is so neat and the fabric on the sofa is right up my alley! Lovely, lovely!! What a great job. I am impressed, so I just became your latest follower!! Wow, what an amazing transformation! I love the sofa and the factory cart! You have accessorized everything beautifully too. What a gorgeous porch! I love all the pieces...columns, mirror, coffee table and the day bed couch. Were these thrift finds? Just found your blog and I LOVE, LOVE, LOVE your porch! Spotted this over at Boogieboard Cottage, love it all! The columns MAKE the room. What a lovely spot! I could stay on your porch a very long time. It's wonderful. Ok, I don't know where Ive been, but I just found your blog and I'm following. Great looking room! The mirror and columns....mmm! What a great room. I love the columns glad that you kept them. What a fabulous porch. 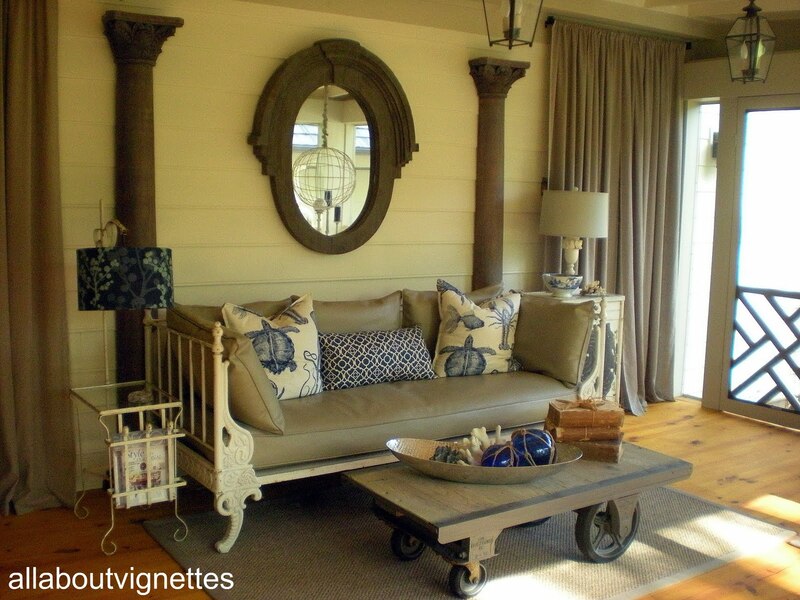 I love the columns and the daybed. Gorgeous!! Visiting from Picket Fence and I am now a follower. Where did you get that couch? I've been looking for one like that for ages. Gorgeous job! I cannot even say how much I love this cart!! I am planning on making a cart like this from scratch. I was wondering if it's too much to ask the approximate measurements of the real one? I can't wait to DIY myself!! I love the cart and the columns - I'm glad you kept those!! Thank you so much for joining my Summer Loving link party! Wow, I love how you accessorize! Such beautiful pieces! So glad you sent me this link! You did a wonderful job on your porch. I see that you are in Maryland....I lived in Annapolis for 25 years! I love how you created an outdoor room. It's so gorgeous and I could see myself spending a lot of time out there. Thanks for joining the Outdoor Extravaganza! WOW! what a wonderful space! Thank you so much for sharing this on our linky party today. Lovely! It looks like a great place to sit and relax. I adore the swirly/chippy medical cabinet, in particular. Beautiful porch, love all those details and remember that cart well. I'd be on this porch every single day!